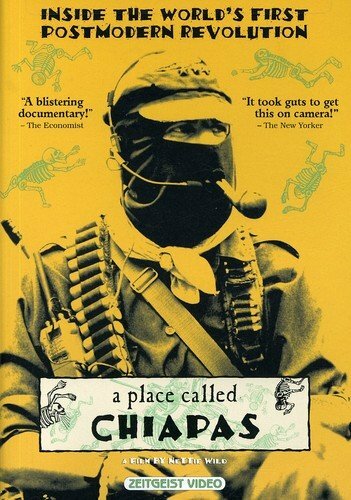 Subcomandante Marcos lights his pipe and says straight into the camera, "You've still got a lot of research to do. I don't know what you have been doing all this time. How long have you been in Chiapas?" "Five months," replies filmmaker Nettie Wild. "Hmm..." says the military commander of the Zapatista uprising, "....I've been here 12 years and I'm barely starting to understand." Marcos is a pipe-smoking, charismatic contradiction. He's a "mestizo", a Mexican of mixed Spanish/Indian blood. He's an intellectual from the city who is the military leader and spokesman for an indigenous guerrilla army. On January 1st, 1994, the Zapatista indigenous uprising took over five towns and 500 ranches in southern Mexico. Then they started communicating their message to the world on the Internet. The Mayan Indians of Chiapas were in Cyberspace. At the keyboard was Subcomandante Marcos. Since the first days of the uprising there has been a nervous ceasefire. Now, three years later, Nettie Wild and her Canadian/Mexican film crew travel to the jungle canyons of Chiapas to capture eight months in the elusive and fragile life of a revolution. Marcos is using the media as a long range missile to hold off 30,000 Mexican army troops who encircle Zapatista territory. His Internet communiqués challenge the Mexican government and taunt the entire international capitalist system. His poetry and rhetoric woo Mexicans with dreams of a new democracy. His stories tell of the Indians of Chiapas, who are so poor they are forced to try and change the world in order to survive it. In the middle is Bishop Samuel Ruiz Garcia. The Mayan people call him "Tatic". It means grandfather. For 30 years the Bishop had worked for peaceful change in Chiapas. Then in 1994, village after village turned to the Zapatistas and went to war. Now, the indigenous people have turned back to the Bishop to mediate a fitful series of peace talks between the Zapatistas and the government. In the north of Chiapas, Manuel Garcia lives outside of Zapatista-protected territory. He and 2000 other indigenous villagers share the Zapatista dream for change.. But now they are homeless and living in fear. They are refugees in their own country. Despite the ceasefire, they have been forced out of their villages by a government backed paramilitary group, which ironically calls itself, "Paz y Justicia" or "Peace and Justice". The paramilitary group accuses anyone who opposes them of being Zapatista guerrillas. On camera, the Peace and Justice accuse the Zapatistas of violence. Off camera, they threaten to kill the Mexican members of the film crew. Out of their homes for four months, the refugees are desperate. They turn to the Bishop and the Zapatistas for help. But Marcos and the commandants' hands are tied by the peace talks. The guerrilla army can't defend the refugees or they will break the ceasefire. The Bishop is also afraid to make a move for fear Chiapas will collapse into civil war. The government denies the paramilitary groups exist. The refugees are left stranded, pawns in a ceasefire. They are fighting a war on their own. Nettie Wild went to Chiapas to film an uprising. She ended up framing the entrapment of a revolution. It is a journey through fear and hope and illusion. In A PLACE CALLED CHIAPAS, nothing is as it first appears.